In May 2015, IV All-Ukrainian student research paper contest on local sustainable development was held within implementation of the joint EU/UNDP “Community Based Approach to Local Development” (CBA) Project. Participants of the contest were students from universities – members of the CBA National partner network. Total amount of received research papers was 35. Received student research papers were thoroughly examined and evaluated by special committee. 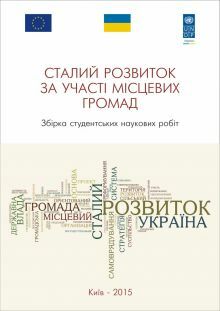 As a result, 15 the best papers written by students from different Ukrainian universities were selected. These research papers cover wide range of issues on sustainable development. The Project has published these papers in the Collection of student research papers on local sustainable development.